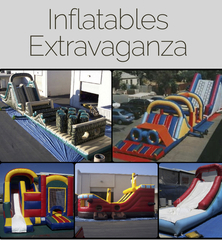 CA180279- Inflatable Manufacturer is Downsizing and Liquidating Hunderds of their Inflatables and Bounce Houses, Water Sldes, Obstacle Courses, Slides, Blowers, Tables, Chairs, and More. AUCTION CLOSING DATE: Tuesday November 27th beginning at 10:37am PDT. Bidding closes the first item at 10:37am PDT then closes 4 items per minute thereafter to the last item in catalog order. LIVE INSPECTION: Monday November 26th 8:30am-12:00pm. REMOVAL: Thursday November 29th 8:30am-4:00pm and Friday November 30th 8:30am to 12:00pm By Appointment Only.